Let's take a port at the ocean, which is declared to be patrimony of the UNESCO World Heritage. Let's color this city so that it makes you smile wherever you look. Let's add to this a tour guide who grew up here and whom everyone knows. Let's stir a bit of a coolness and craziness into this, and you will get a guided tour which you will never forget. 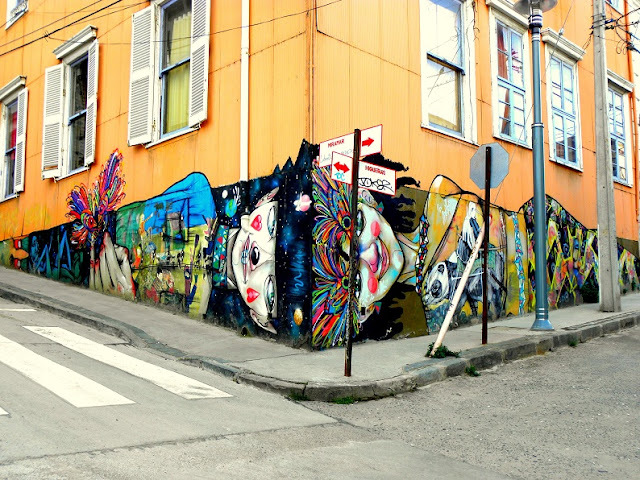 The center of Valparaiso was declared to be patrimony of world heritage in 2003 because of its colorful, bohemian little houses looking at the port, the cobbled labyrinth streets and its unique, urban wall paintings. The name of Valparaiso comes from 'Valle Paraiso', which means Paradise Valley. It is not a coinsidence either that the city is called the 'Gem of the Pacific Ocean' and some European songs from the last centuries also mention its name as a dream destination. After two rainy days, on the first sunny morning finally the city tour kicked off. It started at 9.30am and officially it was supposed to end at 7pm, so I was a little worried how I would manage this long tour, and how I am going to get on with Leo, my tour guide. 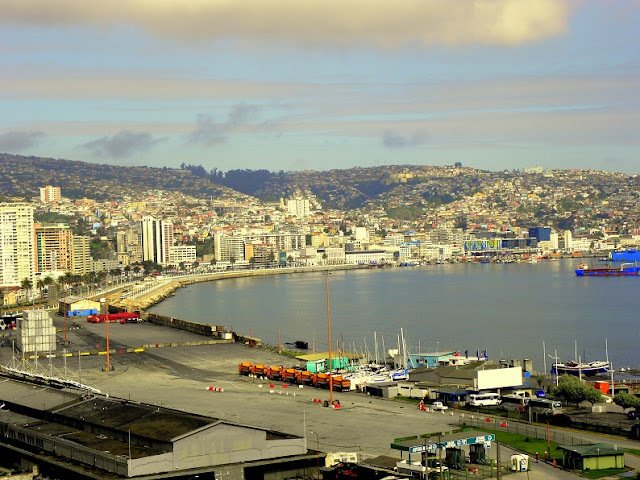 Valparaiso is a port, however behind the little city center on the beach, the majority of the houses are built on the hills behind. When Leo arrived to pick me up, he immediately ensured me that we would never walk uphill, only horizontally or downhill. This leather-jacket, motor-cyclist style fellow became sympathetic instantly. 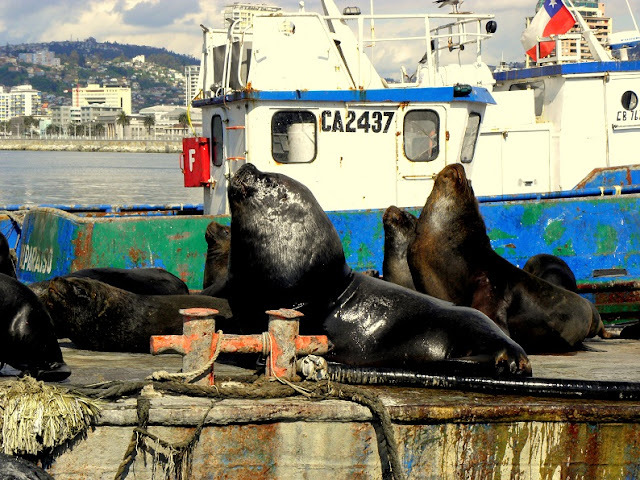 Port of Valparaíso, protagonist of many old sailor songs. Snapshot about the hills of the city. 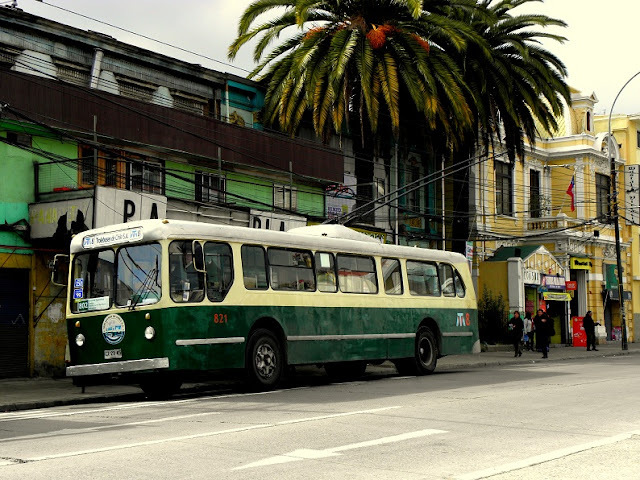 During the tour we traveled around Valparaiso, we walked on the cozy, little streets and we strictly took only local transportation: one of the oldest but still circulating trolleys of the world; the local buses which climbed up on those steep streets, and the inevitable cable cars. Fortunately the morning welcomed us with sunshine, so from the hills we had a breathtaking view on the port and the ocean. To my great surprise in the port we even jumped on a fishing boat to go for a ride and to see Valparaiso from the ocean. The next big surprise for me was when we visited sea lion colonies behind the docks. Those huge animals were peacefully sunbathing only one meter far from me. I wanted to shout in my happiness though I'd have better not. The highlight of the boat tour was when Leo improvidently put me behind the steering-wheel, and from then I was the captain of the little boat. I was rushing in the waves with around 8 km/h and successfully passed by a giant cargo ship. We came up here by a local bus. We traveled with one of the oldest, still circulating trolleys of the world. Then we walked down from that yellow look out. The king of the port. Captain Mariann. Even if only for 5 minutes. After the long walk and big excitement I got really hungry. Leo told me that, unlike their Argentine and Brazilian neighbors who live their lives on the streets, Chilean people are rather reserved, and prefer staying at home or in the backyard. Therefore if one would like to find real good food, should not look for it on the main street. We went for lunch to one of the most exciting places, the J. Cruz, which was named after a local policeman, Jose Cruz. 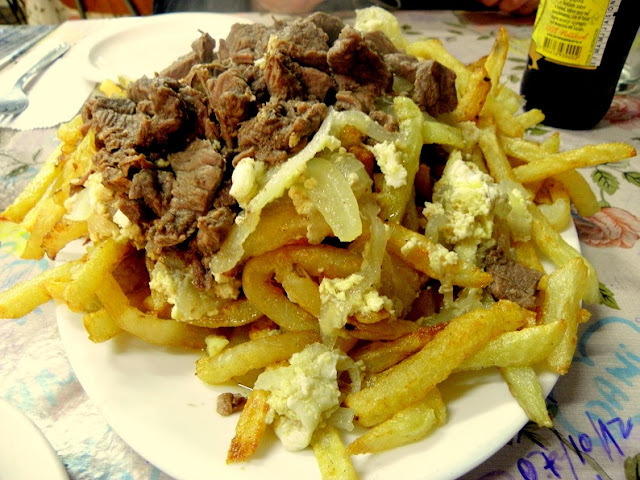 This restaurant was the birthplace of one of the national meals of Chile, the 'chorillana', which is made of the mix of French fries, onion rings, beef and egg on the top. I have always liked these mixtures. The J. Cruz opens from a backstreet, no flashing lights, no luxury, from outside it rather looked like a local pub. When entering I was amazed. I saw cabinets at the walls, China and crystal collections inside and all around the walls. What was more surprising, however, is that short messages were written all around: on the walls, the tablecloths, and on the door frames. If there was no place left, little posts were left behind the windows of the cabinets for lovers, family members or for friends. Lately ID photos were also posted on the walls, making this little restaurant a cozy and personal place. It was a real haunt. Of course the chorillana was great, there is no space for errors here. The best part of the city tour was that during our walks we suddenly popped into locals, who all greeted Leo warmly and started a talk with us spontaneously. Once we dropped by an handicraft shop, where the craftsman told us that his aunt was married to a Hungarian in Valparaiso (such a small world!). He told us anecdotes with this uncle, how he arrived to the end of the world, and how he lived there. In another shop a woman told us excitedly that graffiti artists would arrive to the Polanco district from all over the world, and everyone can enter with his house wall for this big event. When walking on the street, an old lady greeted Leo and asked why there was a bandage on his finger. Leo complained her that he cut it in the morning when peeling his orange. The lady suggested him a healing, which was new to me, to put sugar on the wound. 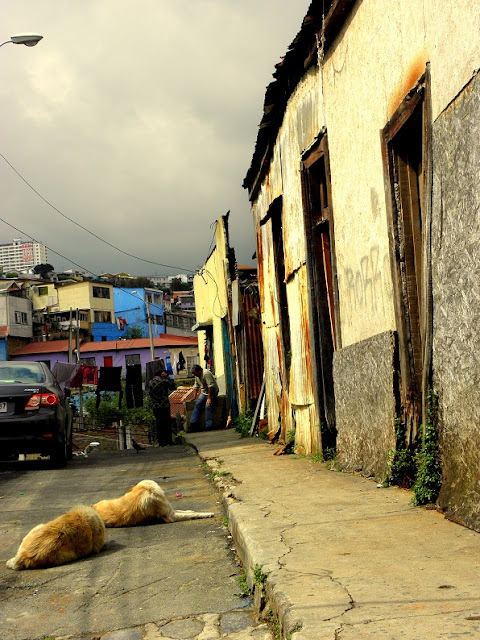 Leo talked a lot about Valparaíso: how people live here, and how the city became so colorful. When I asked him, he did not know the scientific answers for my questions. As he said, he knows everything based on the stories of locals. He talked the whole day as every street had a story. 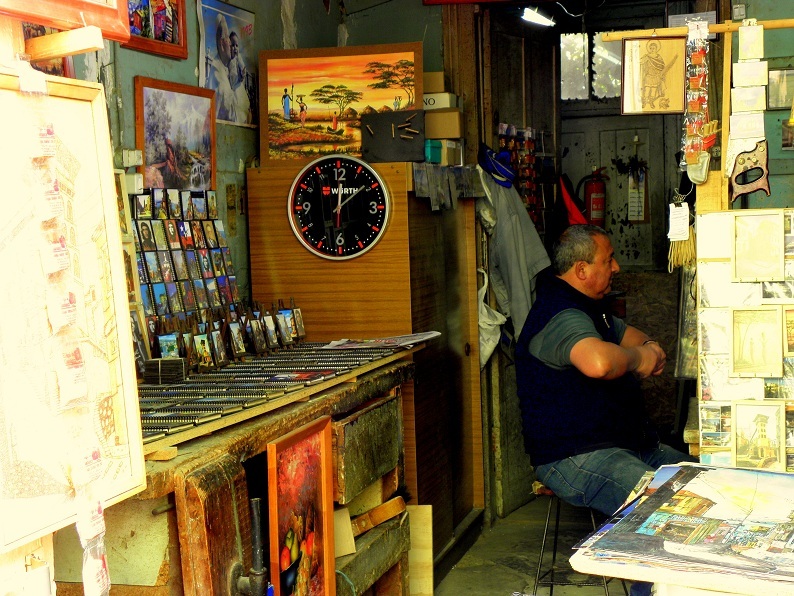 Handicraft shop in a non-touristic neighborhood. 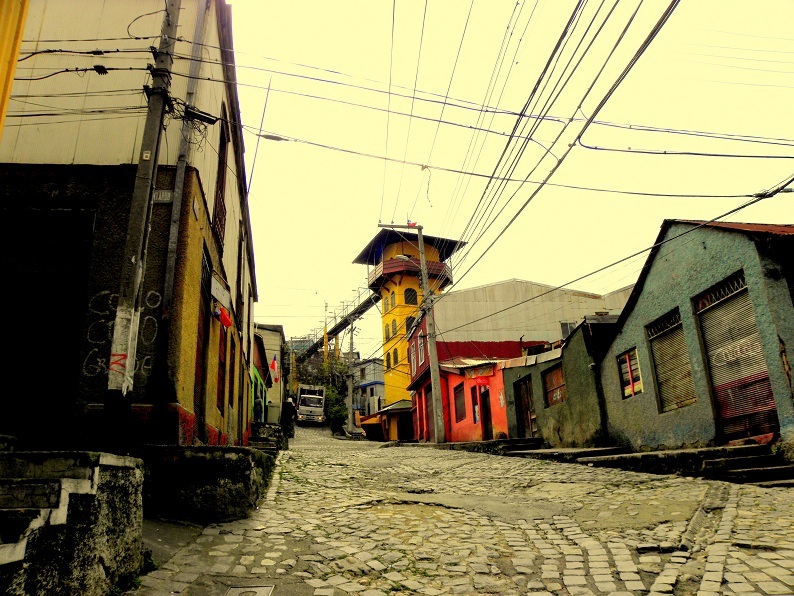 A quiet afternoon on the Polanco hill. Abandoned building on a backstreet. During the day we walked on the biggest hills, we were in the city center and we saw the port. 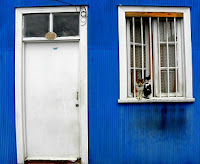 We also saw the crazy house of Ricardo Eliecer Neftalí Reyes Basoalto, better known as Pablo Neruda. For the evening I got a cold because of the wind, but when Leo left me at my accommodation I was still in a good mood. When closing the door behind me, I felt that if only for one day, but I became a local in Valparaiso. 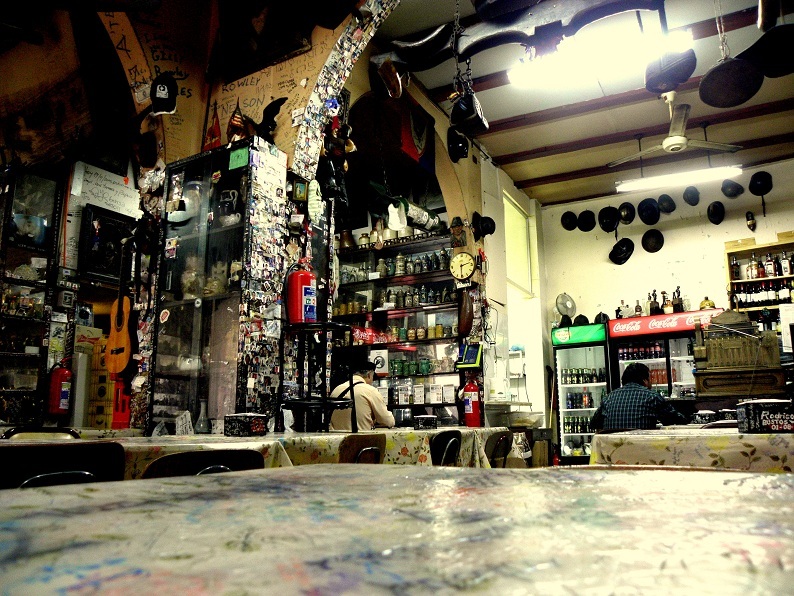 This tour was organized and sponsored by Ruta Valparaíso. If you would like to participate on this or on other tours, drop an email to info@rutavalparaiso.cl with your name, the title of the chosen tour, the date, the number of the participants and the preferred language (English, Spanish, Portuguese or French). I would like to thank to Leo Silva for all the help and this great tour. As always the thoughts in this article are all mine. Hobby writer and autodidact photographer whose passion is to travel and get to know new people and cultures. She has been on 4 continents and 30 countries, and the outcome is this travel blog where she shares travel stories, thoughts, tips and photography always through a subjective eye. 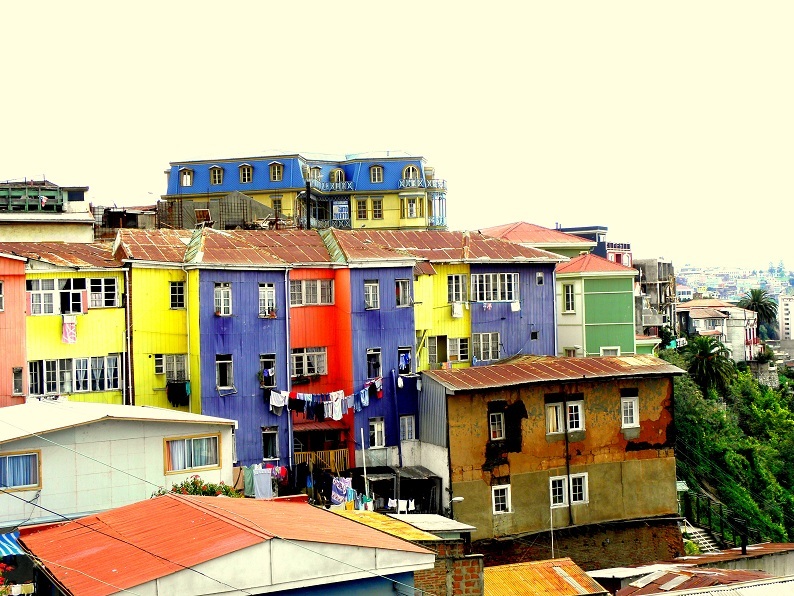 I loved Valparaiso when I was in Chile, I have some amazing pictures of the colorful houses. It was just few weeks after the earthquake in 2010 so it was double special! Great pictures! 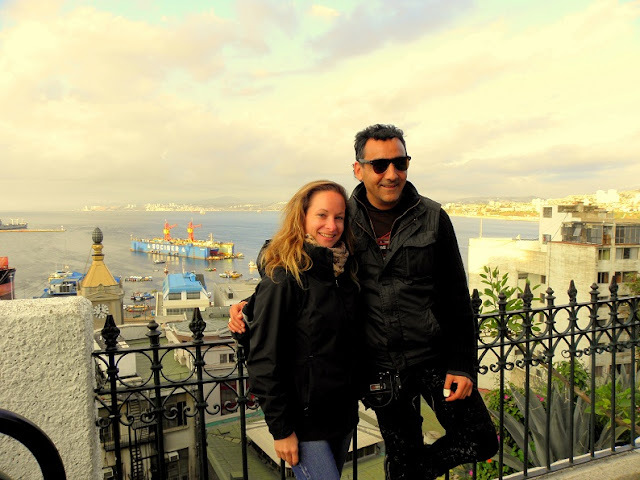 It was indeed, Chile is a beautiful place to travel, amazing and Valparaiso and Easter Island were my favorites! Hmm, I have to make it to Easter Island. When is best to travel? And for how long? Wow! The trip instantly becomes a roaring success when you are lucky enough to find such a great guide. The city looks cool, but I am sure you enjoyed it more because you had a wonderful local by your side. Love Post. Ugh I'm soooo incredibly jealous. I want to get out of my house! You make a very snazzy boat captain. What a colorful place indeed. Great pictures too. 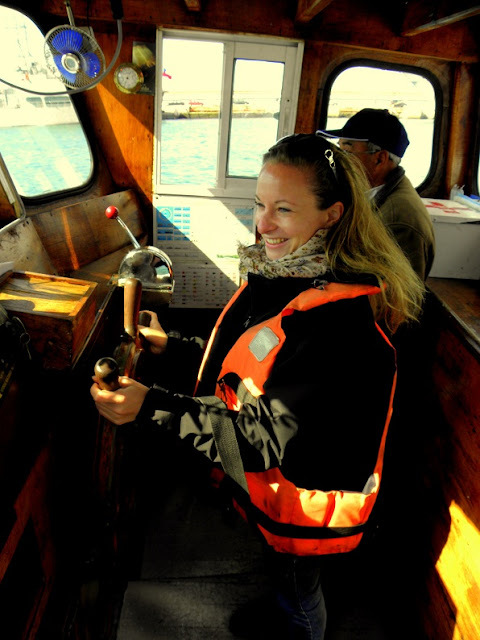 Love that photo of you steering the boat! Haha, the moment when I felt very responsible :) thanks for the comment! You have a very interesting travel blog.